For many couples, planning a wedding can be overwhelming and stressful but it doesn't have to be. With the right planning tools and advice, its much easier for couples to stay on top of everything and ensure your wedding day runs smoothly and on budget. The free Bridebook app helps couples plan their wedding from the very start of their journey right up until their ‘I do’s’. Head of Bridebook Business Bethany Wright shares her expertise in our latest Q&A. Hello! I’m Bethany Wright and I head up the Bridebook Business Community at Bridebook.co.uk, the UK’s leading wedding planning app. I am dedicated to working with UK wedding industry professionals, making sure they maximise their business potential with our platform. On a day to day basis you will find me on the phone talking to wedding venues and suppliers, and working with our product team to develop new and exciting promotional tools. I am originally from Manchester and therefore a very passionate (and proud) Northerner. Yes, gravy is life. I am film obsessed (Gone with the Wind is my fav) and I love nothing more than hunting down the best new places to eat in London and having relaxing nights with friends. Bridebook is the UK’s No.1 Wedding Planning App and website which has helped over 100,000 UK couples plan their wedding and over 80,000 UK wedding businesses generate bookings. Bridebook was founded by Hamish Shephard in 2015. When Hamish left a career in banking, he had no idea he was setting himself up to revolutionise wedding planning. His experience in the wedding industry began when he transformed his grandmother’s old home into a wedding venue. During this process, he quickly discovered that most couples spent the majority of their engagement feeling overwhelmed and confused by the whole wedding planning process. Hamish soon became enamoured by the mission to make wedding planning as enjoyable and fun as the wedding day itself. Thus began a journey of inspiration, discovery and creativity… while also secretly doing all of the necessary boring bits in the background...And the rest is Bridebook! What are some of the biggest challenges couples face when planning a wedding? According to Bridebook’s UK Wedding Report 2018, couples find the most difficult aspect of wedding planning to be managing their guest list (24%) and managing their budget (17%). Couples seem to put a lot of pressure on themselves to make everyone happy but it’s so important for us to remind them that this day is about the two of them. The people that really matter will want the couple to have the day that they want - regardless of how happy or unhappy it makes anyone else! Budget is another big challenge - both in terms of setting one from the beginning and then sticking to it! It’s important that couples are realistic and give themselves time to accurately work out exactly what they can spend, what they want to spend and what they can get for their money in terms of the dream wedding they want. Food and drink (33%) represents the area in which most couples overspend followed by honeymoon (29%) and number of guests (29%). The least difficult aspect of wedding planning is managing suppliers once booked (3%) which is really great to hear. There are so many different types of wedding venues around London, what should couples consider when trying to find the right venue for their wedding? Couples should identify what they’re willing to compromise on because there’s so much choice and so many influencing factors when choosing a London based wedding venue. Budget is often the starting point in helping couples narrow down the right venue for them, followed by location and style. Couples should consider whether they’re looking for an all-inclusive package or whether they want full freedom to design their day as they wish and choose every little detail. Consider the weather too. It would be fab to wed alongside the Thames on a beautiful sunny day but if a thunderstorm arrives instead, have you a Plan B you’re happy with? Also think about nearby or in-house accommodation for guests, although in London, this is less of a problem as there’s bound to be something nearby. Our venues Shoreditch Studios and Kachette are licensed for ceremonies and receptions. What do you see as the advantages to having ceremony and reception in the same venue? Transport is the obvious answer. It’s so much easier for the couple, the suppliers and all guests if you don’t have to travel far to enjoy the next part of the day. The next advantage is cost - it’s cheaper for couples to have the ceremony and reception in the same venue. You will save on transport and may be able to negotiate a better deal with the venue if you’re spending more money with them by staying the entire day. It’s also easier to communicate to guests that they only have to worry about getting to one place for the day! We proudly welcome diversity in our venues. 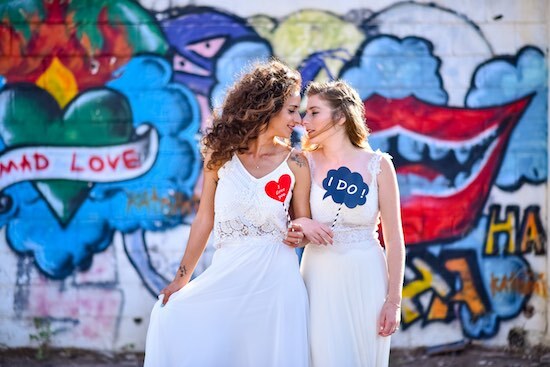 What tips do you offer wedding venues looking to be inclusive and welcoming to all couples? We are huge advocates for diversity in the wedding industry and so advice from us to UK wedding suppliers would be that it’s about identifying which sections of a wedding appeal to which partner. Try not to alienate either partner. As an industry, the less we assume that the bride will be leading the charge, the more we can encourage diversity across all fronts - including the wedding planning efforts between couples. As a start, be gender inclusive and try not to use phrases such as 'normally a bride and groom have this or do that' in your wedding literature or email communications. Consider your use of the words ‘bride and groom’ in the content you write and speak, using the term ‘partner’ or ‘couple’ instead. Similarly with religion and ethnicity - if you approach each new wedding enquiry with an open mind and don’t get too caught up in ‘what has been done at your wedding venue before’ you’ll seem accommodating to couples who are perhaps looking for an altogether different type of ceremony. We are professionals and as professionals we need to be inclusive of all genders, races, religions and cultures. We need to remember that every couple is unique and every aspect of their wedding should be treated as such. Once you’ve started hosting a more diverse array of weddings you’ll be able to promote this through photographs and real wedding features. What is next for Bridebook? Bridebook has had an amazing start to its journey, not only in the wedding industry but in the tech industry too. Our app has been featured 3 times by the App Store, we have been credited in over 300 publications across the globe, our CEO, Hamish Shephard, recently appeared on BBC World News and we support the largest community of wedding professionals in the UK on a daily basis. Have a question for Beth or for Bridebook? Contact them at hello@bridebook.co.uk. on Google Play or the App Store.